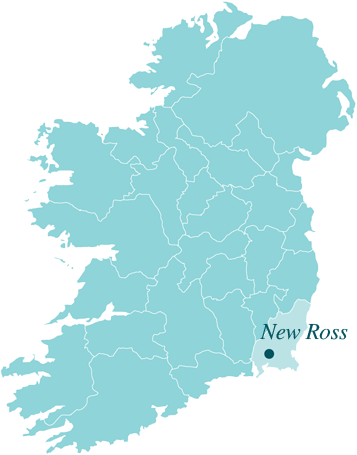 New Ross is a vibrant market town on the banks of the river Barrow and the gateway for that majestic river’s exit into the sea off Ireland’s Southeast coast. At the epicentre of the town sits the Dunbrody Famine Ship and Visitor Centre, a replica of the type of ships, which once brought thousands of people who wanted to escape poverty to different parts of the world; including the family of James O’Neill. The ruins of St Mary’s Church are well worth seeing where lie the remains of Isabel de Clare, wife of the great Knight William Marshal. The quayside in New Ross is also home to the Emigrant Flame, a monument to all those who left Ireland – including JFK’s ancestor Patrick Kennedy – in search of a better life overseas escaping the Great Irish Famine of 1845-1852.
all Eugene O’Neill Festival events and reserved seating. N25, New Ross, County Wexford, Rep of Ireland. 19 The Quay, New Ross, Co. Wexford, Y34 P972. Arthurstown, New Ross, County Wexford, Rep of Ireland. Carrigbyrne, New Bawn, New Ross, County Wexford, Rep of Ireland. Ballinaboola, Foulksmills, County Wexford, Rep of Ireland. Duncannon, New Ross, County Wexford, Rep of Ireland. N25 New Ross / Waterford Road, Slieverue, County Killenny, Rep of Ireland. The Quay, Graiguenamanagh, County Kilkenny, Rep of Ireland. Mullinavat, County Kilkenny, Rep of Ireland. Wexford Road, New Ross, County Wexford, Rep of Ireland. New Ross Road, Graiguenamanagh, County Kilkenny, Rep of Ireland. Great Island, Campile, New Ross, County Wexford, Rep of Ireland. The Maudlins, New Ross, County Wexford, Rep of Ireland. Knockmullen, New Ross, County Wexford, Rep of Ireland. Ballylannon, Wellington Bridge, County Wexford, Rep of Ireland. Rochestown, Wellington Bridge, County Wexford, Rep of Ireland. Mount Garrett, New Ross, County Wexford, Rep of Ireland. The Rower (R700), Inistioge, County Kilkenny, Rep of Ireland. The Rower, New Ross Road, Inistioge, County Kilkenny, Rep of Ireland. The Rower, Inistioge, County Kilkenny, Rep of Ireland. Ballycocksuist, Inistioge, County Kilkenny, Rep of Ireland. Weatherstown, Glenmore via Waterford, County Waterford, Rep of Ireland. Ballyling Lower, Graiguenamanagh, County Kilkenny, Rep of Ireland. Lukeswell, Mullinavat Road N9 Via Kilkenny, County Waterford, Rep of Ireland. 96 Mary St, New Ross, Co. Wexford.